For the Ostrogoth invasion of Italy, see Battle of Isonzo (489). 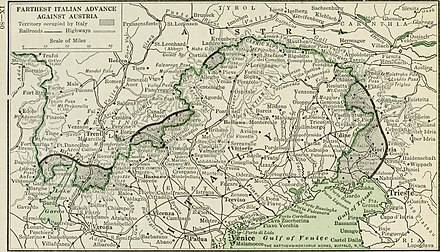 The Battles of the Isonzo (known as the Isonzo Front by historians, Slovene: soška fronta) were a series of 12 battles between the Austro-Hungarian and Italian armies in World War I mostly on the territory of present-day Slovenia, and the remainder in Italy along the Isonzo River on the eastern sector of the Italian Front between June 1915 and November 1917. Depiction of the Battle of Doberdò. The plain at the confluence of the Soča and Vipava rivers around Gorizia is the main passage from Northern Italy to Eastern Europe. In April 1915, in the secret Treaty of London, Italy was promised by the Allies some of the territories of Austro-Hungarian Empire which were mainly inhabited by ethnic Slovenes. Italian Field Marshal Luigi Cadorna, a staunch proponent of the frontal assault, initially planned breaking onto the Slovenian plateau, taking Ljubljana and threatening Vienna. The area between the northernmost part of the Adriatic Sea and the sources of the Isonzo River thus became the scene of twelve successive battles. The sixty-mile long Soča River at the time ran entirely inside Austria-Hungary in parallel to the border with Italy, from the Vršič and Predil passes in the Julian Alps to the Adriatic Sea, widening dramatically a few kilometers north of Gorizia, thus opening a narrow corridor between Northern Italy and Central Europe, which goes through the Vipava Valley and the relatively low north-eastern edge of the Karst Plateau to Inner Carniola and Ljubljana. The corridor is also known as the "Ljubljana Gate". With the rest of the mountainous 400-mile length of the Front being almost everywhere dominated by Austro-Hungarian forces, the Soča (Isonzo) was the only practical area for Italian military operations during the war. The Austrians had fortified the mountains ahead of the Italians' entry into the war on 23 May 1915. Italian Chief of Staff Luigi Cadorna judged that Italian gains (from Gorizia to Trieste) were most feasible at the coastal plain east of the lower end of the Soča (Isonzo). 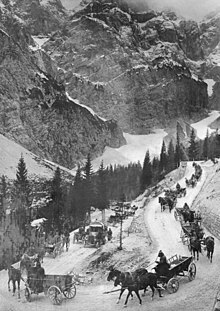 However he also believed that the Italian army could strike further north and bypass the mountains either side of the river so as to come at the Austro-Hungarian forces in the rear. Cumulative casualties of the numerous battles of the Isonzo were enormous. Half of the entire Italian war death total – some 300,000 of 600,000 – were suffered along the Soča (Isonzo). 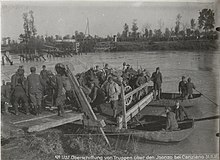 Austro-Hungarian losses, while by no means as numerous were nevertheless high at around 200,000 (of an overall total of around 1.2 million casualties). More than 30,000 casualties were ethnic Slovenes, majority of them being drafted in the Austro-Hungarian Army, while Slovene civil inhabitants from the Gorizia and Gradisca region also suffered in many thousands because they were resettled in refugee camps where Slovene refugees were treated as state enemies by Italians and some thousands died of malnutrition in Italian refugee camps. Total casualties June 1915 – November 1917 950,151 520,532 Central Powers victory, counteroffensives on the Piave. Ernest Hemingway's A Farewell to Arms is partly set in the events along this front. Italian poet Giuseppe Ungaretti's autobiographical poem, "I Fiumi", was written about the Isonzo whilst he was stationed on the Front. Mark Helprin's A Soldier of the Great War refers to parts of the Isonzo campaign. The twelfth battle is the subject of the novel Caporetto by the Swedish author F. J. Nordstedt, Stockholm 1972. ^ Palazzo, Albert (2002). Seeking Victory on the Western Front. Lincoln, NB: University of Nebraska Press. p. 111. Retrieved 25 September 2018. Wikimedia Commons has media related to Battles of the Isonzo.